Florence Adele Vanderbilt Twombly (1854–1952), granddaughter of Cornelius Vanderbilt, renowned as the richest man in America, and her husband, financier, Hamilton McKown Twombly, came to the Morris County countryside in 1887, joining over 100 other millionaires who owned sprawling country retreats. They fancied an English-style country mansion in a stately park setting. "Florham," built on 840 acres (3.4 km2), one of America's finest Gilded Age homes, was the result. The couple named their new estate "Florham," a combination of their first names, Florence and Hamilton. The second part to the name "Florham Park" received its name from a second mansion in town that was on about 1,000 acres (4.0 km2) of land situated where the current Brooklake Country Club is located. Owned by Dr. Leslie Ward — one of the founders of the Prudential Insurance Company and the first vice president of the company — it was named "Brooklake Park", partially because of the beautiful lake that was on the property. 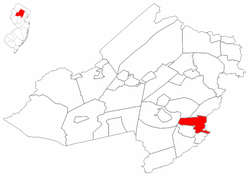 The Borough is located in southeastern Morris County and is bordered to the south by Madison and Chatham Boroughs; to the north by Hanover and East Hanover Townships; to the west by Morris Township; and on the east by the Passaic River where it borders Essex County communities Livingston and Millburn Townships. At the 2010 United States Census, there were 11,696 people, 4,003 households, and 2,798 families residing in the borough. The population density was 1,604.9 per square mile (619.7/km2). There were 4,201 housing units at an average density of 576.4 per square mile (222.5/km2). The racial makeup of the borough was 86.35% (10,099) White, 4.35% (509) Black or African American, 0.07% (8) Native American, 6.37% (745) Asian, 0.07% (8) Pacific Islander, 1.10% (129) from other races, and 1.69% (198) from two or more races. Hispanics or Latinos of any race were 5.08% (594) of the population. Florham Park is the North American headquarters of the BASF corporation, the world's largest chemical company. 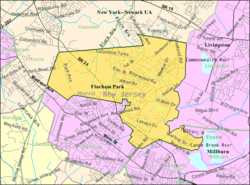 Florham Park is governed under the borough form of New Jersey municipal government. The governing body consists of a mayor and a borough council comprising six council members, with all positions elected at-large on a partisan basis as part of the November general election. A mayor is elected directly by the voters to a four-year term of office. The borough council consists of six members elected to serve three-year terms on a staggered basis, with two seats coming up for election each year in a three-year cycle. The borough form of government used by Florham Park, the most common system used in the state, is a "weak mayor / strong council" government in which council members act as the legislative body, with the mayor presiding at meetings and voting only in the event of a tie. The mayor can veto ordinances subject to an override by a two-thirds majority vote of the council. The mayor makes committee and liaison assignments for council members, and most appointments are made by the mayor with the advice and consent of the council. As of 2016, the mayor of Florham Park is Republican Mark Taylor, serving a term of office ending on December 31, 2019. Members of the borough council are Council President Thomas Michalowski (R, 2016), Scott Carpenter (R, 2018), Carmen Cefolo-Pane (R, 2018), Charles A. Germershausen (R, 2017), Charles J. Malone, Jr. (R, 2017) and William Zuckerman (R, 2016). In May 2013, the borough council chose Council President Mark Taylor from a list of three candidates nominated by the Republican municipal committee to fill the vacant mayoral seat of R. Scott Eveland, who had resigned from office in March from a term expiring in December 2015. At the same meeting, the council selected Thomas Michalowski from the list of three candidates nominated to fill the vacant council seat of David Wikstrom, who had resigned in April from a term expiring in December 2013. In April 2013, the council chose William Zuckerman from the list of three nominees to fill Mark Taylor's vacant council seat expiring in December 2016. Morris County is governed by a seven-member Board of Chosen Freeholders, who are elected at-large to three-year terms on a staggered basis, with either two or three seats up for election each year as part of the November general election. The Freeholder Board sets policies for the operation of six super-departments, more than 30 divisions plus authorities, commissions, boards and study committees. Actual day-to-day operation of departments is supervised by County Administrator, John Bonanni. As of 2016, Morris County's Freeholders are Freeholder Director Kathryn A. DeFillippo (Roxbury Township, term ends December 31, 2016), Deputy Freeholder William "Hank" Lyon (Montville, 2017), Douglas Cabana (Boonton Township, 2016), John Cesaro (Parsippany-Troy Hills Township, 2018), Thomas J. Mastrangelo (Montville, 2016) Christine Myers (Mendham Township, 2018), and Deborah Smith (Denville, 2018). Constitutional officers are County Clerk Ann F. Grossi (Parsippany-Troy Hills Township, 2018), Sheriff Edward V. Rochford (Morris Plains, 2016) and Surrogate John Pecoraro (Mendham Borough, 2019). Students in public school for ninth through twelfth grades are served by the Hanover Park Regional High School District, attending Hanover Park High School together with students from East Hanover Township, where the school is located. The district also serves students from the neighboring community of Hanover Township at Whippany Park High School in the Whippany section of Hanover Township. As of the 2013-14 school year, the high school had an enrollment of 870 students and 81.8 classroom teachers (on an FTE basis), for a student–teacher ratio of 10.6:1. Portions of the College of Saint Elizabeth campus are in Florham Park, including the Villa of Saint Ann, a classical Greek amphitheater built into a hillside, and the original dairy farm for the complex. 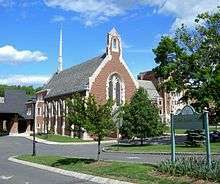 Portions of the Fairleigh Dickinson University's Florham Campus, also are located in Florham Park. As of May 2010, the borough had a total of 48.73 miles (78.42 km) of roadways, of which 37.56 miles (60.45 km) were maintained by the municipality, 8.01 miles (12.89 km) by Morris County and 3.16 miles (5.09 km) by the New Jersey Department of Transportation. New Jersey Transit provides bus service from the borough to Newark on the 70 and 73 routes, with local service on routes 878 and 879. Service had been offered on the MCM8 route, which was suspended in 2010 after subsidies to the contract provider were eliminated as part of New Jersey Transit budget cuts. Tiki Barber (born 1975), former professional football who played for the New York Giants. Salvatore A. Bontempo (1909-1989), politician who served as chairman of the New Jersey Democratic State Committee. Eric Duncan (born 1984), former professional baseball player. Johan Hedberg (born 1973), former NHL goaltender. Ralph A. Loveys (born c. 1929), politician who was elected to three terms in the New Jersey General Assembly, where he represented the 26th Legislative District. Florence Adele Vanderbilt Twombly (1854-1952), heiress and a member of the Vanderbilt family. Hamilton McKown Twombly (1849-1910), businessman. 1 2 2012 New Jersey Legislative District Data Book, Rutgers University Edward J. Bloustein School of Planning and Public Policy, March 2013, p. 121. 1 2 Borough Council, Borough of Florham Park. Accessed July 24, 2016. ↑ Borough Administrator, Borough of Florham Park. Accessed July 24, 2016. ↑ Office of the Municipal Clerk, Borough of Florham Park. Accessed July 24, 2016. ↑ U.S. Geological Survey Geographic Names Information System: Borough of Florham Park, Geographic Names Information System. Accessed March 5, 2013. 1 2 3 4 5 6 DP-1 - Profile of General Population and Housing Characteristics: 2010 for Florham Park borough, Morris County, New Jersey, United States Census Bureau. Accessed April 24, 2012. 1 2 3 4 Municipalities Grouped by 2011-2020 Legislative Districts, New Jersey Department of State, p. 12. Accessed January 6, 2013. 1 2 3 Table DP-1. Profile of General Demographic Characteristics: 2010 for Florham Park borough, New Jersey Department of Labor and Workforce Development. Accessed April 24, 2012. 1 2 GCT-PH1 Population, Housing Units, Area, and Density: 2010 - State -- County Subdivision from the 2010 Census Summary File 1 for New Jersey, United States Census Bureau. Accessed December 18, 2012. ↑ Look Up a ZIP Code for Florham Park, NJ, United States Postal Service. Accessed April 24, 2012. ↑ Area Code Lookup - NPA NXX for Florham Park, NJ, Area-Codes.com. Accessed October 13, 2013. ↑ A Cure for the Common Codes: New Jersey, Missouri Census Data Center. Accessed July 10, 2012. ↑ Table 7. Population for the Counties and Municipalities in New Jersey: 1990, 2000 and 2010, New Jersey Department of Labor and Workforce Development, February 2011. Accessed June 22, 2012. 1 2 3 Snyder, John P. The Story of New Jersey's Civil Boundaries: 1606-1968, Bureau of Geology and Topography; Trenton, New Jersey; 1969. p. 193. Accessed April 24, 2012. ↑ Jets Choose Florham Park for New Headquarters, 1010-WINS, March 30, 2006. ↑ Chartier, John. "FLORHAM PARK WAS FOUNDED BY ANGER OVER TAXES", Daily Record (Morristown), March 30, 1999. Accessed April 24, 2012. 1 2 Cheslow, Jerry. "If You're Thinking of Living In/Florham Park; Good Schools, Yes, but Low Taxes, Too", The New York Times, October 30, 1994. Accessed April 24, 2012. "The name 'Florham' is a combination of the first syllables of the names of Florence and Hamilton Twombley. The word 'Park' came from the Ward estate, which was called Brooklake Park." ↑ Locality Search, State of New Jersey. Accessed May 21, 2015. ↑ Compendium of censuses 1726-1905: together with the tabulated returns of 1905, New Jersey Department of State, 1906. Accessed October 12, 2013. ↑ Thirteenth Census of the United States, 1910: Population by Counties and Minor Civil Divisions, 1910, 1900, 1890, United States Census Bureau, p. 338. Accessed June 22, 2012. ↑ Fifteenth Census of the United States : 1930 - Population Volume I, United States Census Bureau, p. 717. Accessed April 24, 2012. 1 2 3 4 5 Census 2000 Profiles of Demographic / Social / Economic / Housing Characteristics for Florham Park borough, New Jersey, United States Census Bureau. Accessed April 24, 2012. 1 2 3 4 5 DP-1: Profile of General Demographic Characteristics: 2000 - Census 2000 Summary File 1 (SF 1) 100-Percent Data for Florham Park borough, New Jersey, United States Census Bureau. Accessed July 10, 2012. ↑ DP03: Selected Economic Characteristics from the 2006-2010 American Community Survey 5-Year Estimates for Florham Park borough, Morris County, New Jersey, United States Census Bureau. Accessed April 24, 2012. ↑ Welcome to BASF in North America, BASF. Accessed April 24, 2012. "BASF Corporation, headquartered in Florham Park, New Jersey, is the North American affiliate of BASF SE, based in Ludwigshafen, Germany. BASF has approximately 16,400 employees in North America, and had sales of $17.7 billion in 2010." ↑ 2016 Municipal Data Sheet, Borough of Florham Park. Accessed July 24, 2016. ↑ Morris County Manual 2016, Morris County, New Jersey Clerk. Accessed July 19, 2016. As of date accessed, Taylor is listed as mayor with an incorrect term-end year of 2018. ↑ Morris County Municipal Elected Officials For The Year 2016], Morris County, New Jersey Clerk, updated June 3, 2016. Accessed July 19, 2016. ↑ November 3, 2015 Official General Election Winners, Morris County, New Jersey Clerk. Accessed July 19, 2016. ↑ November 4, 2014 General Election Winners, Morris County, New Jersey Clerk. Accessed July 19, 2016. ↑ November 5, 2013 General Election Winners, Morris County, New Jersey Clerk. Accessed July 19, 2016. ↑ Remaly, Jake. "Taylor Tapped for Florham Park Mayor; Thomas Michalowski also appointed to serve on Borough Council after two elected officials resigned days apart. ", East Hanover-Florham Park Patch, May 7, 2013. Accessed July 29, 2015. "Florham Park's governing body appointed Council President Mark Taylor as mayor on Thursday night and appointed Thomas Michalowski to the council, filling vacancies left by the resignations of former Mayor R. Scott Eveland and appointed Thomas Michalowski to fill the vacant council seat of David Wikstrom." ↑ Robinson, P.C. "Busy night as Florham Park presents new councilman, budget", Florham Park Eagle News, April 25, 2013. Accessed July 29, 2015. "Long-time borough volunteer fireman William Zuckerman, whose day job is that of chief financial officer for Sussex County's Vernon Township, was sworn in to fill the remaining months to the seat once occupied by Acting Mayor Mark Taylor." ↑ 2016 New Jersey Citizen's Guide to Government, p. 57, New Jersey League of Women Voters. Accessed July 20, 2016. ↑ 2011 New Jersey Citizen's Guide to Government, p. 57, New Jersey League of Women Voters. Accessed May 22, 2015. ↑ What is a Freeholder?, Morris County, New Jersey. Accessed July 5, 2016. 1 2 3 Morris County Manual 2016, Morris County Clerk. Accessed July 5, 2016. ↑ Kathryn A. DeFillippo, Morris County, New Jersey. Accessed July 5, 2016. ↑ William “Hank” Lyon, Morris County, New Jersey. Accessed July 5, 2016. ↑ Douglas R. Cabana, Morris County, New Jersey. Accessed July 5, 2016. ↑ John Cesaro, Morris County, New Jersey. Accessed July 5, 2016. ↑ Thomas J. Mastrangelo, Morris County, New Jersey. Accessed July 5, 2016. ↑ Christine Myers, Morris County, New Jersey. Accessed July 5, 2016. ↑ Deborah Smith, Morris County, New Jersey. Accessed July 5, 2016. ↑ Freeholders, Morris County, New Jersey. Accessed July 5, 2016. ↑ Ann F. Grossi, Esq., Office of the Morris County Clerk. Accessed July 5, 2016. ↑ About Us: Sheriff Edward V. Rochford, Morris County Sheriff's Office. Accessed July 5, 2016. ↑ Morris County Surrogate Court, Morris County, New Jersey. Accessed July 5, 2016. ↑ Voter Registration Summary - Morris, New Jersey Department of State Division of Elections, March 23, 2011. Accessed December 18, 2012. ↑ "Presidential General Election Results - November 6, 2012 - Morris County" (PDF). New Jersey Department of Elections. March 15, 2013. Retrieved December 24, 2014. ↑ "Number of Registered Voters and Ballots Cast - November 6, 2012 - General Election Results - Morris County" (PDF). New Jersey Department of Elections. March 15, 2013. Retrieved December 24, 2014. ↑ 2008 Presidential General Election Results: Morris County, New Jersey Department of State Division of Elections, December 23, 2008. Accessed December 18, 2012. ↑ 2004 Presidential Election: Morris County, New Jersey Department of State Division of Elections, December 13, 2004. Accessed December 18, 2012. ↑ "Governor - Morris County" (PDF). New Jersey Department of Elections. January 29, 2014. Retrieved December 24, 2014. ↑ "Number of Registered Voters and Ballots Cast - November 5, 2013 - General Election Results - Morris County" (PDF). New Jersey Department of Elections. January 29, 2014. Retrieved December 24, 2014. 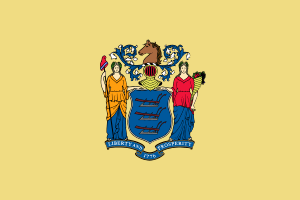 ↑ 2009 Governor: Morris County, New Jersey Department of State Division of Elections, December 31, 2009. Accessed December 18, 2012. ↑ District information for Florham Park School District, National Center for Education Statistics. Accessed July 1, 2014. ↑ School data for the Florham Park School District, National Center for Education Statistics. Accessed July 1, 2014. ↑ Briarwood Elementary School, Florham Park School District. Accessed October 13, 2013. ↑ Brooklake Elementary School, Florham Park School District. Accessed October 13, 2013. ↑ Ridgedale Middle School, Florham Park School District. Accessed October 13, 2013. ↑ Schools, Florham Park School District. Accessed October 13, 2013. ↑ New Jersey School Directory for the Florham Park School District, New Jersey Department of Education. Accessed October 13, 2013. ↑ Hanover Park Regional High School District 2015 Report Card Narrative, New Jersey Department of Education. Accessed June 5, 2016. "The Hanover Park Regional High School District is comprised of two high schools. Hanover Park High School is located in East Hanover, receives students from East Hanover and Florham Park, and has an enrollment of 855 students. Whippany High School is located in Hanover Township, receives students from Hanover Township and has an enrollment of 714 students." ↑ School Data for Hanover Park High School, National Center for Education Statistics. Accessed June 5, 2016. ↑ Our History, Holy Family School. Accessed October 12, 2013. ↑ Morris County, Roman Catholic Diocese of Paterson Catholic Schools Office. Accessed September 12, 2015. ↑ Staff. "Florham Park", FDU Magazine, Fall / Winter 2001. Accessed April 24, 2012. "In 1899, led by Mother Mary Xavier, the Sisters of Charity established the College of St. Elizabeth, the first New Jersey college to grant degrees of higher education to women. In 1901, the college's first building, Xavier Hall, was constructed, and it now serves as the main building for the Academy of St. Elizabeth. Florham Park solidified its reputation as a college town when Fairleigh Dickinson University purchased the splendid Twombly estate and opened a campus in 1958." ↑ Morris County Mileage by Municipality and Jurisdiction, New Jersey Department of Transportation, May 2010. Accessed July 18, 2014. ↑ Riding the Bus, Morris County Department of Transportation. Accessed December 2, 2014. ↑ Morris County System Map, New Jersey Transit. Accessed July 29, 2015. ↑ Morris County Bus / Rail Connections, New Jersey Transit, backed up by the Internet Archive as of May 22, 2009. Accessed December 2, 2014. ↑ NJ TRANSIT RESTRUCTURES MORRIS COUNTY BUS SERVICE; Four current 'MCM' routes will be expanded to six new bus routes, New Jersey Transit, September 13, 2010. Accessed August 7, 2015. ↑ Wilson, David McKay. "Making Masterpieces", Bowdoin Magazine, Spring 2004. Accessed August 27, 2008. 1 2 3 4 McCarthy, Breanne. "Florham Park is No. 1 On Our List of Top Towns; A low tax rate, laudable schools boost Morris County municipality. ", New Jersey Monthly, September 1, 2015. Accessed September 12, 2015. "Jets players can be spotted around town, and several celebrities have made Florham Park home, including Nicole Elizabeth LaValle (better known as Snooki), retired Giants running back Tiki Barber and retired NHL goaltender Johan Hedberg." ↑ Narvaez, Alfonso A. "Salvatore Bontempo, 79, a Leader In New Jersey Democratic Politics", The New York Times, June 22, 1989. Accessed September 12, 2015. "Salvatore A. Bontempo, a former state chairman of the Democratic Party in New Jersey and a government official at the local, state and Federal levels, died of cancer Tuesday at his home in Florham Park, N.J."
↑ James, George. "IN PERSON; The New Jersey Chronicles", The New York Times, May 10, 1998. Accessed December 18, 2012. "One recent morning, Mr. Cunningham, who had traveled from his home in Florham Park, Morris County, stood on the campus at Stevens Institute of Technology here, being videotaped for a New Jersey Network historical series called New Jersey Legacy, to be broadcast around Christmas." ↑ Pearce, Jeremy. "IN PERSON; Don't Call Him a Historian", The New York Times, January 5, 2003. Accessed December 18, 2012. "'A century passes and it's not so long ago,' reflected John T. Cunningham, whose words were formed slowly and seemed to float for a moment before him.... For half a century, the words of the Florham Park social historian have reached children studying his textbooks and touched readers exploring his broader histories of the Garden State." ↑ Kuty, Brendan. "N.J. high school legend Eric Duncan will be 'big asset' to Yankees, official says", NJ Advance Media for NJ.com, January 23, 2015. Accessed August 31, 2015. "It's not quite the path Florham Park native Eric Duncan envisioned when the Yankees selected him out of Seton Hall Prep in the first round of the 2003 draft." ↑ Matzner, Frank A. "Mark Guiliana: New Beats", All About Jazz, April 8, 2008. Accessed May 27, 2014. "All About Jazz: You were born and raised in New Jersey, correct?... MG: I went to school at William Paterson. I'm from Morris County, a town called Florham Park." ↑ Farberman, Brad. "Mark Guiliana Starts a Rousing New Chapter; A man and his groove", JazzTimes, December 11, 2014. Accessed September 12, 2015. "Born and raised in Florham Park, N.J., Guiliana discovered music at age 15, mostly on his own." ↑ Sullivan, Joseph F. "LEGISLATURE TO CONFRONT INSURANCE BILLS", The New York Times, December 6, 1987. Accessed September 12, 2015. "The most controversial measure - sponsored by Assemblyman Ralph A. Loveys, Republican of Florham Park and chairman of the Insurance Committee - would forge a major shift in public policy." ↑ "Bill Raftery to receive Curt Gowdy Media Award", CBS SportsLine.com. Accessed July 3, 2007. "Raftery lives in Florham Park, N.J., with his wife, Joan, and has four children and one grandchild." ↑ Lowitt, Bruce. "Super Bowl notebook", St. Petersburg Times, January 18, 2001. Accessed August 31, 2015. "New Jersey native Tony Siragusa, a Ravens defensive tackle and resident of Florham Park, N.J., and Giants defensive end Michael Strahan, who lives in nearby Montclair, N.J., have been good friends since meeting two years ago at several charity functions." ↑ Griffith, Janelle. "Snooki buys new $2.6M Florham Park home", NJ Advance Media for NJ.com, January 20, 2015. Accessed January 26, 2015. "Nicole 'Snooki' Polizzi is expanding her real estate portfolio. The Jersey Shore alum purchased a $2.6 million home in Florham Park with her husband Jionni LaValle, property records show."